CoverGirl’s latest collaboration with writer, actor, and producer Issa Rae, best known for the popular web series Awkward Black Girl and HBO's Insecure, appears to be spurring conversation. New numbers from YouGov BrandIndex suggest that more US women aged 18-34 have recently reported talking about CoverGirl than at any time since YouGov began tracking the makeup brand in 2007. 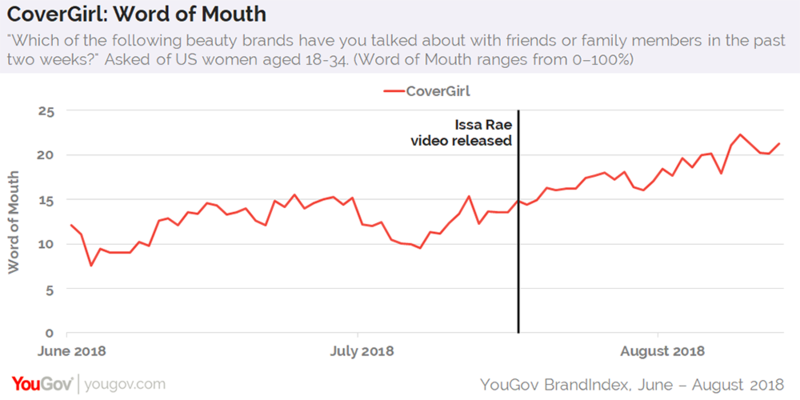 Following the July 17 release of Rae's video campaign titled Shade for Shade, which promotes CoverGirl’s 48-shade Exhibitionist Lipstick collection, the brand’s Word of Mouth metric climbed seven percentage points from 15% to 22% among female millennials, meaning over one in five had discussed CoverGirl with friends or family members in the past two weeks.